Hope you are all doing really well ? I have been so busy lately that a nice day or two to myself has been the perfect way to get some blog posts written up. I have also been house hunting with my boyfriend, so it has been exciting but nervous times for me haha. Today’s post is going to be short but sweet, as it’s actually a TAG I have created myself. I have wanted to create a TAG for ages, but its something I just haven’t got around to… and I feel a bit weird answering my own questions haha but hey ho! – I really enjoyed doing this TAG, and I would love for some of my readers to do it and send me the links via twitter which I will RT… So I TAG you ;) In a nutshell this is a Autumn/Winter inspired Beauty Tag, which I hope you will all enjoy reading and doing if you like :D. As always, I love hearing from my loyal readers, so don’t forget to leave your links and comments down below. What is your current go to foundation for A/W 13? It would have to be my YSL Youth Liberator Foundation in B30! It gives amazing coverage and stays put all day, as well as having great skincare benefits. What is your favorite Lip Balm for winter? My own Jewel By India R Lip Balms! They are so luxurious, and their thick balmy texture keeps my lips moisturized all day. If you had to choose to wear one lipstick shade all winter what would it be? I can think of at least five :O but if I had to pick one shade for the whole of winter I would choose Laura Mercier 60’s Pink. It’s a really gorgeous baby Pink shade, and it looks so pretty with a subtle Smokey eye, which I wear a lot in the winter days. Describe your most worn wintery make up look? I always ditch my Peach tones for my Pinks in the winter, as I think they look more natural and flattering. I also go for a subtle brown Smokey eye in the daytime, as I think it helps to make your eyes pop. I then opt for a slightly higher coverage foundation, to help keep my skin looking flawless all day long. What beauty product would you most like to try next? I already have the sample size, but I would love to get my hands on the bigger size of the new Estee Lauder Advanced Night Repair ii Serum. I’m loving the sample size, and can definitely see myself purchasing the bigger one when it runs out. What are your favorite products in your current skincare routine? This changes all the time haha! But the products that stand out are my Emma Hardie Cleansing Balm, Elemis Pro Radiance Cream Cleanser, Elemis Apricot Toner and my Origins Super Spot Remover! I haven’t put down my Prada Candy recently; I’m a sucker for the sweetie scents. 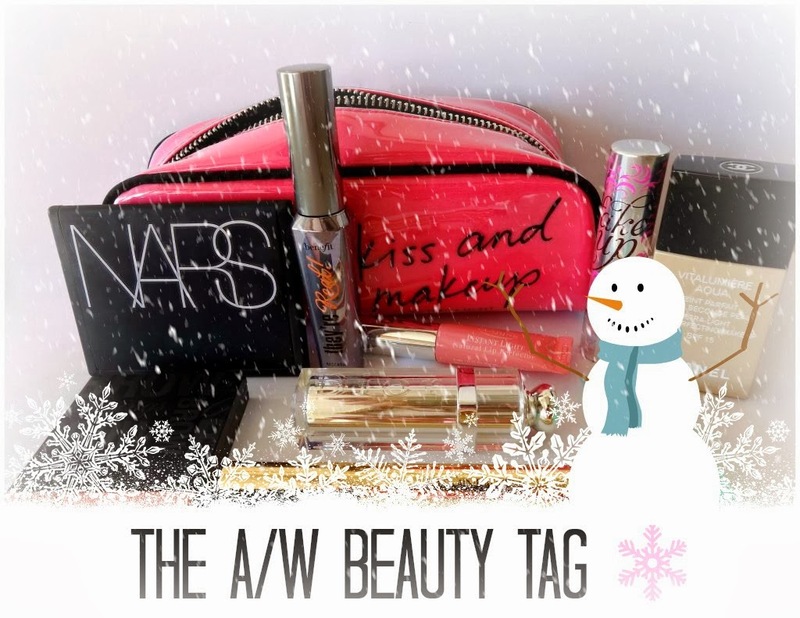 Well lovelies that’s my A/W Beauty TAG done! I hope you enjoyed it, and I would love to see some of you give it a go and give me some feedback! Make sure you send me the links if you do decide to do it, and I will make sure I RT them on twitter for you. Speak soon beauts! I'll do this tag for sure next month, at this moment I'm still living in South America where is spring so I have to wait until next month to be in Europe and be able to enjoy the A/W! Love all your answers for this tag, just followed you on bloglovin' too.